Learn about some of the core features available within the OPOC Product Suite. Flexible Mobile Forms Technology That Gives Your Teams The Tools To Provide Better Results And Improve Compliance. Learn about some of the core sectors the OPOC Product Suite is the perfect companion for. Are you demonstrating you are focused on your social, economic and environmental impact? The Retail sector is just one area which has a large responsibility. They build new stores, develop areas, support communities, create jobs and build eco-systems to support themselves. It’s clear to see, leading companies are talking big steps to demonstrate their positive contribution to local social, economic impact studies. Social: OPOC is managing very complex projects, which are scattered all over the UK & Europe and we’ve not lost one piece of data. The system control centre seamlessly gathers and collates, text, pictures, video, signatures etc, into a simple dashboard which can be configured to show only the critical information you want. With one click reporting, means the users no longer has to gather and collate large amounts of information, which releases enormous amount of time back to the user to better use elsewhere. Economic: Our results have shown, time saved using OPOC is considerable, we’ve seen improvements of up to 70% reduction on projects time when using OPOC. These improvements are spread throughout a project, meaning each activity can be simplified, reduce errors and completed quicker, which can deliver huge savings. Environmental: Any business using remote workforce’s will incur substantial transport costs. If these services are not efficient, we regularly see two key factors, completion dates not achieved and higher costs. The cause of these two factors, come from simple issues which are not rectified while remote teams are still on site. OPOC’s live stream data and issue notification has greatly cut the amount of site revisits, keeping costs down and reducing vehicles on the road. To discover more about OPOC and how we can help you save your money while improving your social, economic and environmental impact, please visit our website at www.opoc.co.uk or alternatively click the below button, fill out the contact form and we'll get straight back to you. 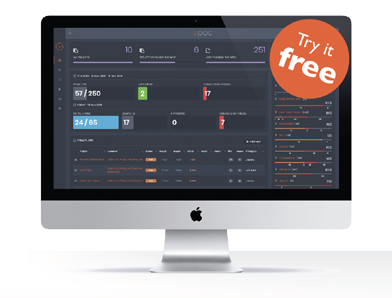 See how you can revolutionise the way you manage your installations, audits & surveys with OPOC. Simply register and follow our OPOC wizard to help you set up your first project. Experience sending jobs to any OPOC mobile app user and watch 'Live' information stream into your control centre.